I planned my departure from the Salem Oregon area this past weekend so that I could hopefully catch the sun going down over the blooming Schreiner's Iris Gardens just outside of Keizer. The Keizer Iris Festival was actually just last week, so my stop for this photo caught the irises in their prime bloom. Oh wow! This is a glorious location! I can only dream to find a place like this! What a superb, capture of a glorious sunset, Sarah!! This one really took my breath away!!! Thanks for sharing! Beautiful photo, both flower field and sky! Wow - I've never seen a field of irises! Beautiful. Amazingly dramatic skies! A beautiful shot. 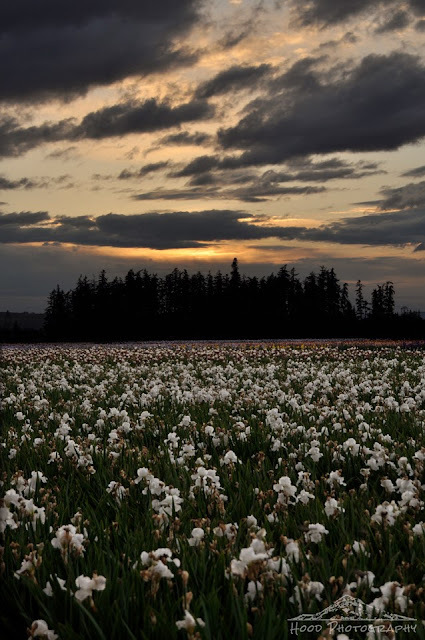 Being patient you captured the right moment to share these irises and what a sunset. Thank you. Brilliant images. Well you certainly caught this at just the right moment. It's beautiful. I'm going to have to plan a trip to Keizer next year for the Iris Festival.... so pretty!